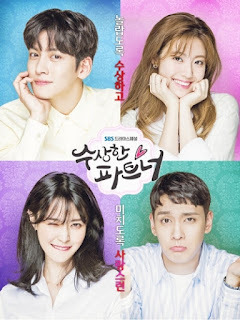 Suspicious Partner (Hangul: 수상한 파트너; RR: Susanghan Pateuneo) is a 2017 South Korean television series starring Ji Chang-wook and Nam Ji-hyun, with Choi Tae-joon and Kwon Na-ra. It airs on SBS at 22:00 (KST), every Wednesday and Thursday, starting May 10, 2017. Plot: Noh Ji-wook (Ji Chang-wook) is a unique prosecutor. He is handsome, hard-headed and intelligent who strives hard to be successful. He is the perfect example of what a prosecutor should be. Eun Bong-hee (Nam Ji-hyun) is a prosecutor trainee. Once a former taekwondo instructor, she trained to become a lawyer. She is confident and strong, but naive. She is assigned to work under No Ji-wook. They work together on a mysterious case involving a sly psychopath murderer. As they're working as a team, they develop affection between them.